Time for some ego tripping. Winning isn’t everything in contesting. I have to keep that in mind because winning a contest from my location and with my setup is next to impossible. So I focus on the fun factor and personal achievement. Which means I do like to put down a good score and squeeze the last drop out of the lemon. So in this year’s EUHFC I finished #10 (CW only HP). Furthermore I am at 99 / 100 of the Top 100 Honor Roll when it comes to log checking and score deduction. Before you say “ So what, 99 is way down from the top! 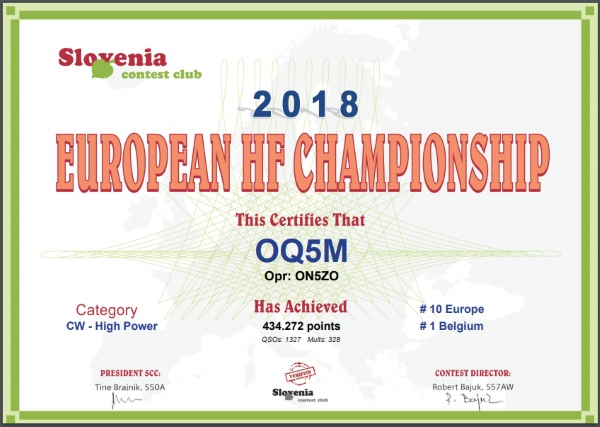 ”: there are only three participants on that list with more than 1000 QSO in the log and I logged the most QSO in that top 100 (1327 after checking). Most logs have less than 100 Q, some even only one or two. It’s easier to have two contacts 100% correct than it is to log 1300+ without any errors. So again: clean log and accuracy, a personal achievement. Moreover I occupy 12 spots in the 100 best scores ever from z14. So I may not be a winner as such, I think this shows that I’ve got this contest thing figured out. Should anyone need proof of that. Other than myself. And that I’m crazy enough to spend a lot of time in the shack playing in these contests. When’s the next one? More than three months passed since my last CW contest so LZ DX Contest vintage 2018 came just in time. No goals, no targets, no stress. Just one radio. Go with the flow and (try to) have fun. As is the case with these contests: the first few hours are fast and then it slows down. There is no ten meters and fifteen was an Rf-desert which makes it worse. I tried fifteen meters for as many minutes and logged only a dozen contacts so down to 14 MHz. That made more sense but the rate wasn’t really spectacular. I was having fun though. Since I wasn’t going to be competitive I unchecked the ‘post score to server’ box in N1MMLogger. But after a while I decided to check cqcontest.net and lo and behold: I was doing fine. To hell with ‘not competitive’. I checked the box and joined the fun. In hindsight this was the best decision I made in this contest. Seeing your real time score makes you take less breaks and work harder. It’s a major motivator and adds fun to this already fun packed game. At least that’s how I see it. And so the contest progressed and I was on top of the game. At least among those who posted their scores. I had to be realistic: 65% of what I log is worth 1 point (EU). RT9S works the same stations but gets 3 points credit because for him it’s another continent. So don’t compare to RT9S. Then suddenly D41CV joins the game. Other continent and ‘callsign gain’. So my target is being above UC7A, DL6KVA and SP1NY. The other posters didn’t seem to move as much as these stations. At a given point I even turned on the second radio! 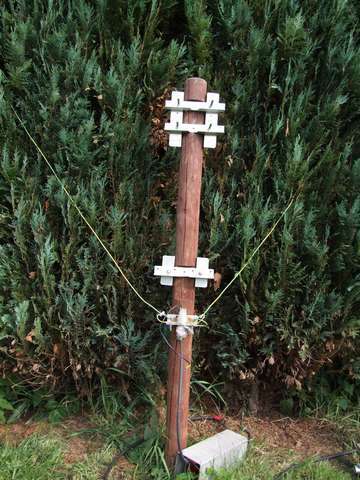 I took down the 10-15-20 vertical a few years ago so I can only do SO2R with the antennas for 40 and 80 and the yagi. Which is no problem given where we are in the sunspot cycle. I run either 40m and 20m and look for QSO on the other band. I even did ‘alternating CQ’ on two bands. Fun stuff in such a modest contest. It keeps you busy, increases the rate and the live score board is a motivator. As the evening made way for the night things were getting slow. I was well ahead of SP1NY which had become ‘the guy to beat’. Around 0utc (1AM local) I decided to take a break and get some sleep. I had the easy mults on 80 (USA and VE) and there isn’t much to do when EU goes to bed. The usual American suspects were already logged. My guess was that SP1NY would also go to bed or won’t log that many goodies. And if so: who cares (is what I tried to tell myself). Later on RT9A and D41CV updated their scores and I was even out of the top five! I stayed on 40 and 80 as long as possible with both radios, even running both bands. And then the same routine on 40/20. I checked ten meters. The RBN picked up a few LZ but I didn’t hear a thing. Fifteen was poor too. I tried running and got answered by a few Far East calls: HS, YB and even a JA and a VK. Warsaw – Sofia = 1100km on a pure N-S path versus Brussels – Sofia = 1800 from here SE (111°). I couldn’t work a thing under 2000km. Many red spots and unworked LZ stations but I could not hear them. 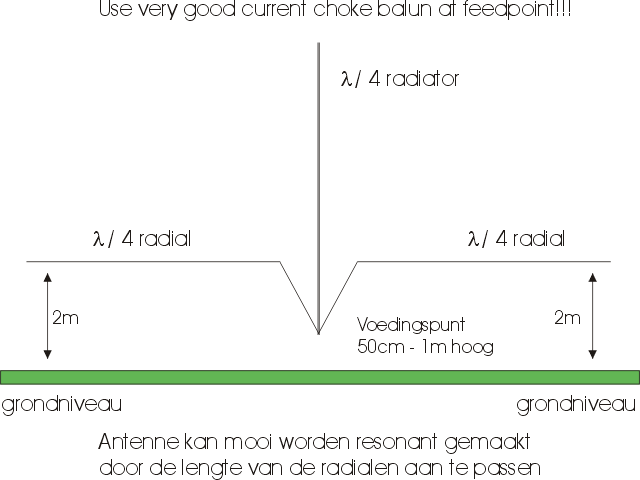 Maybe my antenna is too high on 15m for this range? Must be as the UA and UA9 were loud and even those JA, HS, YB and VK were not weak… Bummer! 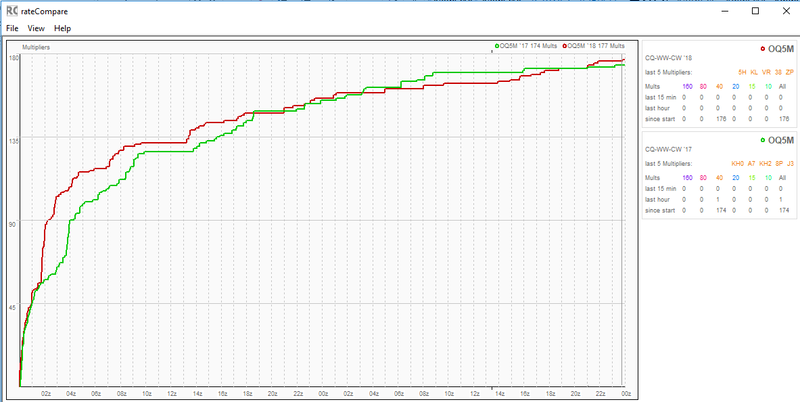 A few hours to go and I hoped that 15m would open up a bit for the more local stuff especially LZ. It more or less happened but it wasn’t a big success. I did manage to jump over SP1NY again. I tried 10m again in a pathetic effort to work more multipliers. A Dutchman, a German and a Belgian. Not even easy! Then fifteen again: a slow run and calling everything I could on 40m. 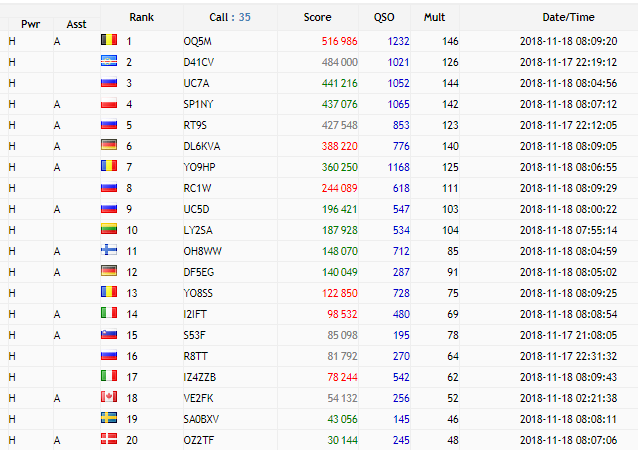 I wanted to know how many ‘second radio QSO’ I made but the above table doesn’t tell the story anymore because I also made run QSO and not only S&P. I forgot and just realized that all QSO on 80m were made with radio #2 which means with the small 500W amp. I left the Big Amp (1200W) on 40. 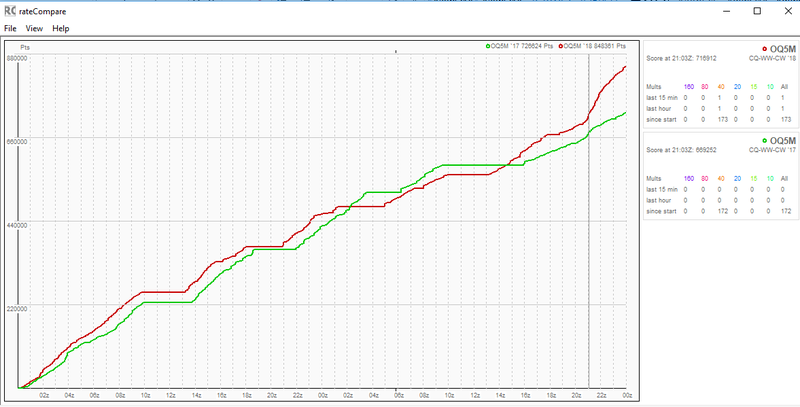 The last hour I settled on 20m and stayed there. It seemed the most sane thing to do. I’m happy with the result and what’s even better: I had a good time. I can’t wait to have 15 and 10 back though. And a second antenna for those bands.